The infamous dress that has become increasingly popular for its color illusion (is it blue and black or white and gold?) is now being used to bring attention to a more significant issue of domestic violence. 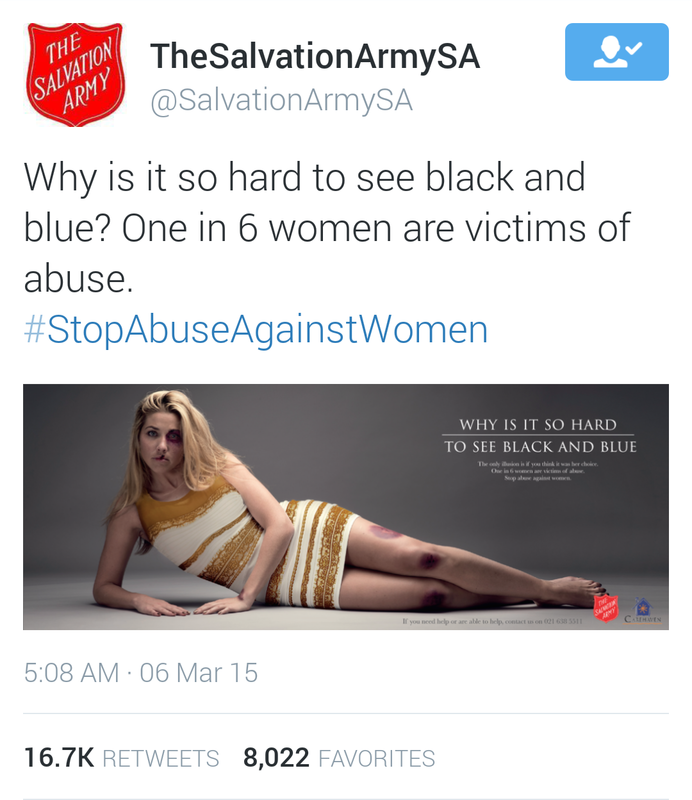 The South African branch of the Salvation Army retweeted an ad which posed the question on a photo of a woman wearing “the dress. “ The woman was covered in black and blue marks all over her body. Nearly 4.8 million women in the U.S experience domestic violence. The Salvation Army has served as a safe haven for victims of domestic abuse for over 150 years and ranks as the second largest provider of shelter for domestic violence victims. The original ad was designed by the Ireland/Davenport agency in Johannesburg and was advertised in the Cape Times Newspaper on Friday morning, according to the Washington Post.